St. Vincent's summer fete is taking place this year on Saturday June 26th from 12-4 pm. Acton based artist Rachel Tooth is donating a dedicated piece of art to St Vincent’s Roman Catholic School, which will be auctioned at the school’s summer fete on Saturday 26 June at the school in Pierrepoint Road. 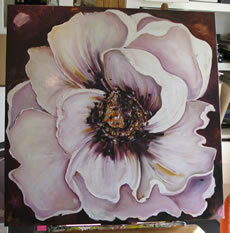 The painting is a close up of a beautiful white flower measuring 900mm x 900mm and is oil on linen. The Auction will take place at approximately 3.30pm during the school fete to be held at St Vincent’s School on Saturday 26th June from 12pm – 4pm. The fete and the auction have been organised by The St Vincent’s Parents and Friends Association. Rachel’s work typically sells in the range of £500 - £1200 depending on the canvas size, though she has completed and installed a commissioned work, an abstract family group tryptich, which sold for £5,500 and another large commission last year, one of which is 5.5m x 1.75m and is hanging in Balans, Kensington. Please come along to the fete and bid! The St Vincent’s fete includes go-karts, sumo-wrestling and Beat The Goalie as well as more traditional activities such as Hook A Duck, Lucky Dip, a Treasure Hunt, Crockery Smash, a Children’s Tombola, Candy Necklaces, Face Painting and hair-braiding, not to mention Bottle Stall, Toy Stall, Gift Stall and Bric a Brac stalls and a vast selection of International Food provided by the school community.